Feb. 4, 2009 -- The Department of Music at Arkansas State University-Jonesboro will present the University Trio from the University of Tennessee-Martin on Monday, Feb. 9 at 7:30 p.m. in Ric eland Hall, Fowler Center. The public is encouraged to attend the performance, which will be free of charge. 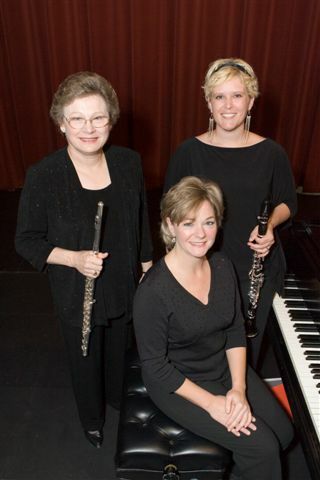 The trio will feature Elaine Harriss, flute, Amy Simmons, clarinet, and Delana Easley, piano. Special guest Kenneth Zimmerman, director of UTM’s Vanguard Theater, will join the trio to narrate Norman Rockwell’s story of a little songbird in “Willie Was Different.” This special piece for flute, clarinet, piano, and narrator was written by Seymour Barab, a contemporary American composer. The trio’s program includes two additional works by living American composers-- “Trio No. 1,” composed by flutist Gary Schocker in 2000, and “Fantasia” by Howard Buss. They will also perform “Interludia” by Jitna Snizkova, a 20th century Czech composer and musicologist, and “Andante ad Variations: by Pietro Bottesini, a 19th century Italian clarinetist. Dr. Harriss, interim chair and professor of music at UTM, received her doctorate from the University of Michigan and served as principal flutist in the Jackson and Paducah Symphony Orchestras for a total of 25 years. Dr. Simmons, assistant professor of music, received her doctorate from Arizona State University, has given solo and chamber recitals throughout Europe as well as the U.S., and has recently released a solo CD featuring the music of Russell Reipe. Ms. Easley, lecturer and staff accompanist for UTM, is very active as a soloist and collaborative pianist in the area.